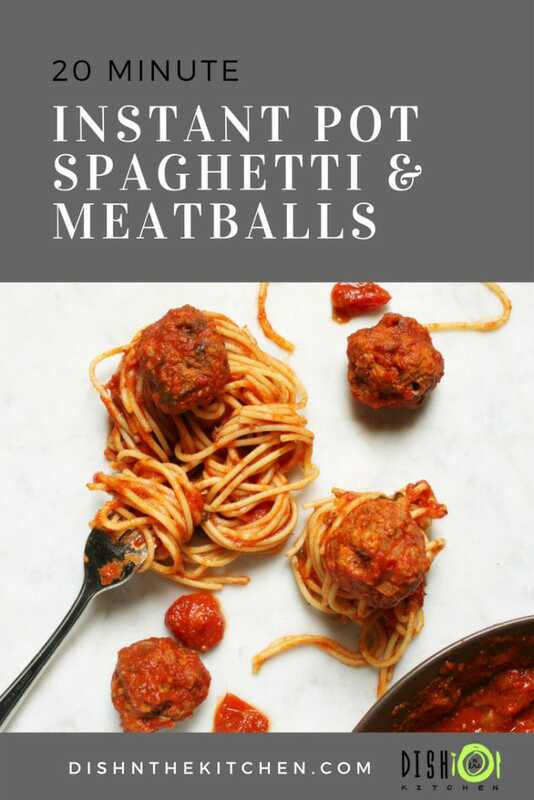 Instant Pot Spaghetti and Meatballs on the table in 20 minutes?! This isn’t a drill. 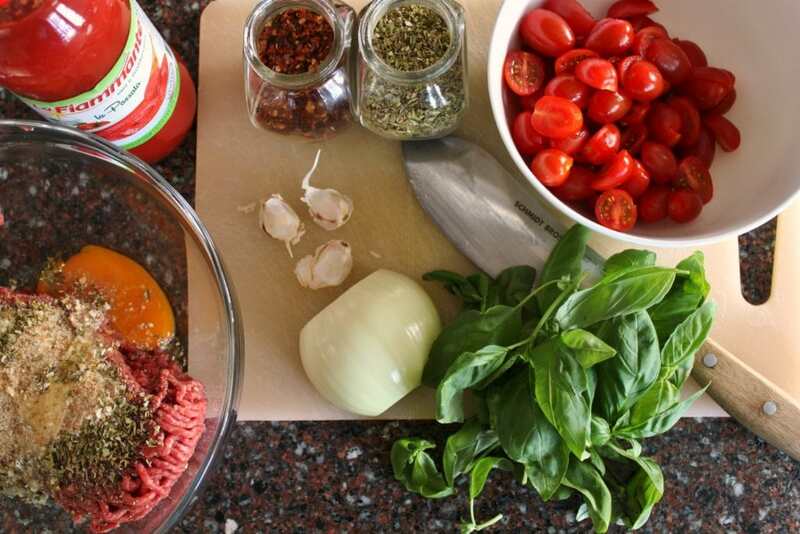 Gather up a few simple pantry ingredients then combine them with fresh minced beef, basil, and grape tomatoes for a lightning quick weekday dinner. I was reading the Spring 2016 issue of Ricardo Magazine during football practice last night. This particular issue is filled with all sorts of Canadian food related statistics and I found many of them quite interesting. From the Atlantic coast to the Pacific coast, it seems as though we Canadians have many differences in our food preferences and styles…but the most overwhelming statistic to me was that 40% of all Canadians start planning dinner at 4 pm. Oh, man…does that sound familiar to me! That 4 o’clock panic when you open the fridge and try to scrape something together before you taxi the kids off to wherever it is they have to be. It really hit home that I am not alone in this world, or country. Dinner in Less than 30 Minutes? No Way! I am always looking for recipes that are tasty and can be made within an hour or less but most of the time I just wing it with what is in the refrigerator and see what happens. On Sunday my son had football from 5:30-7:30. Such a difficult time; it is too early to eat before and then when we got home everyone was starving and hangry. Plus, we always watch The Walking Dead together as a family before the teens head off to bed. So basically I was given half an hour to make dinner. Challenge accepted! 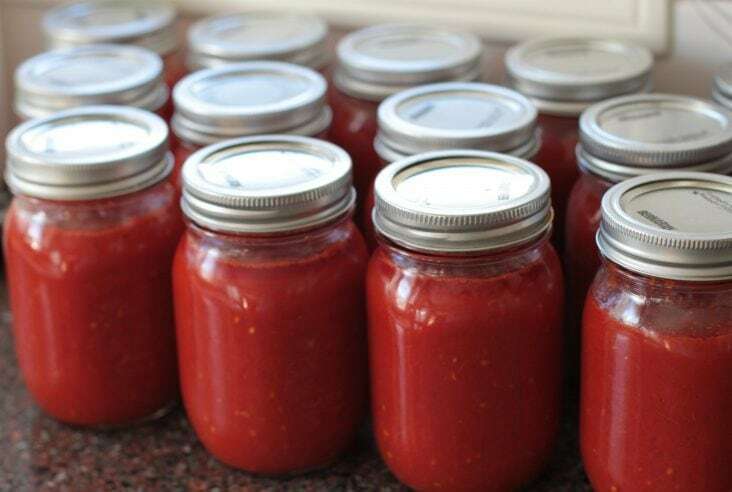 Luckily I still have jars of my home made passata and that sauce, along with the beef mince, grape tomatoes, fresh basil, and other pantry staples became the ingredients for my Instapot Spaghetti and Meatballs. I enlisted some help from the family, shouting out ingredients to be retrieved from the basement (sauce), pantry (Spaghetti, spices and herbs, bread crumbs, garlic, and onion), and fridge (grape tomatoes, eggs, beef mince) while I started a pot of salted water for the spaghetti and set up the Instant Pot. 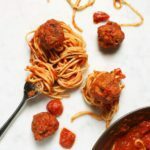 I added all the meatball ingredients and mixed them up, then got hubby to form the balls while I added all the sauce ingredients to the Instant Pot. When all the meatballs had been dropped into the Instant Pot, I closed the lid and added 15 minutes to the manual timer. Then I boiled the spaghetti. Fifteen minutes later we were eating and enjoying our Instant Pot Spaghetti and Meatballs and the latest Walking Dead episode. Everyone's favourite combo made in the instant pot. Add first seven ingredients to an Instant Pot. 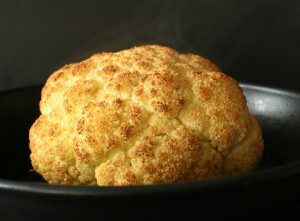 Add next seven ingredients in a mixing bowl and combine well using a spoon. 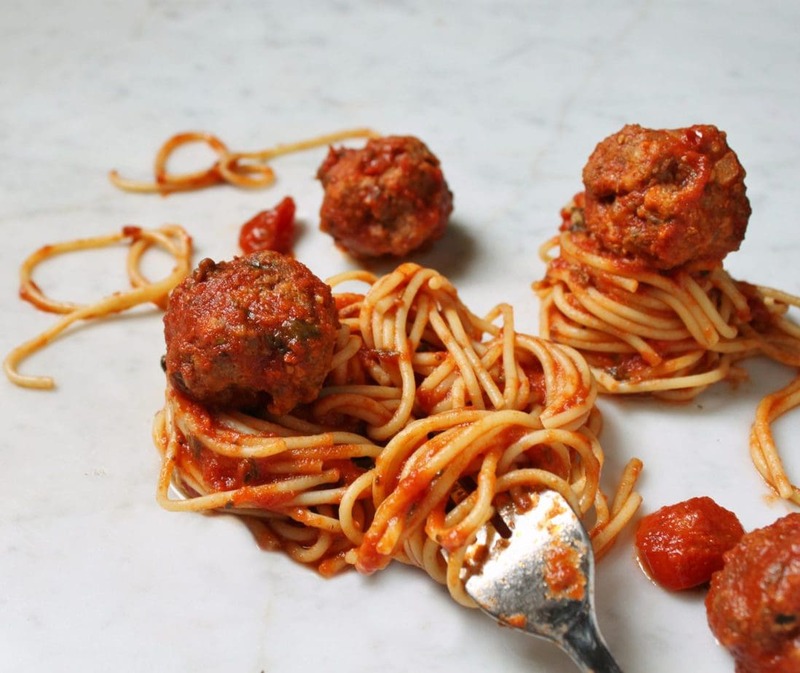 Form a large tablespoon full into a meatball and drop it into the sauce. Repeat with the rest of the mixture. Using the manual feature on the Instant Pot, add 15 minutes to the timer and make sure the pressure is set to high. Cook spaghetti in salted boiling water according to package directions. One of my favourite food :). 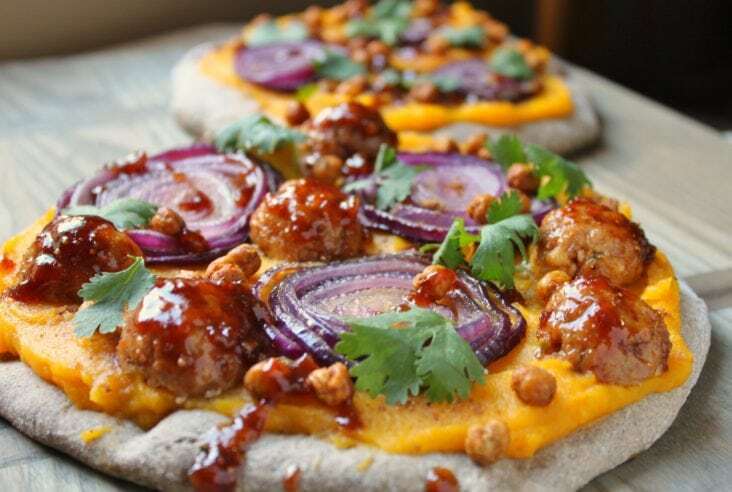 Easy and yummy .. So much comfort-food-y goodness. 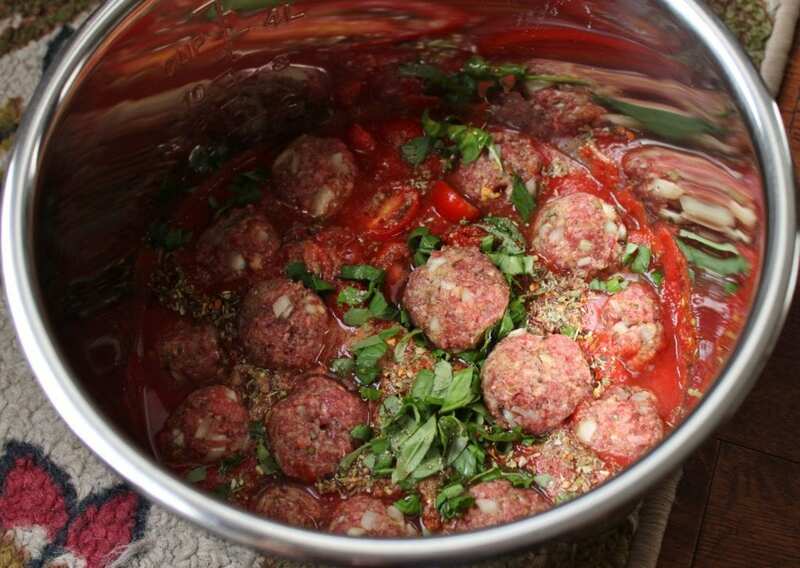 The meatballs look spectacular, and I love how fresh and flavourful the sauce looks. Awesome dish. So I pretty much live for meatballs – this recipe excites me Bernice. Also, I LOVE that it comes together so quickly. Like you I usually aim to make dinner within an hour or less – it takes time to prep real ingredients so an hour is perfectly legit. But half an hour?! Hell, I’m pinning for this week! !